If you remember back when Centrex service was available from your local phone company, then the latest trend of enterprise voice communication moving to the cloud is like Deja Vu. It seems that we've been here before. Infonetics Research conducted in-depth surveys with 162 medium and large organizations in North America and discovered that by 2016 over 50 percent of respondents will be running some of their Unified Communications (UC) applications over either a private or public cloud service. UC integrates fragmented communication modes -- such as voice, e-mail and instant messaging -- into a single integrated communication experience. 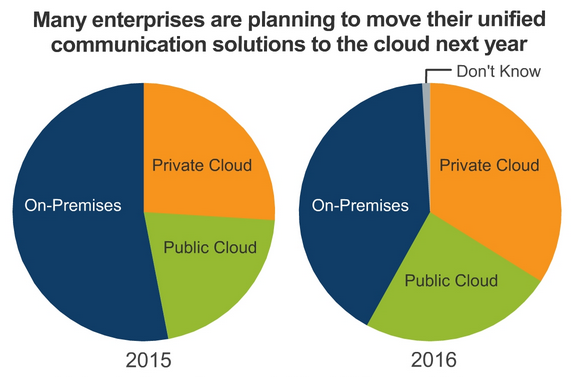 The latest Infonetics worldwide market study explored CIO and IT manager plans for UC and their perceptions of UC vendors and cloud unified-communications‑as-a-service (UCaaS) providers. "Businesses continue to migrate their unified communications applications to the cloud, citing flexibility as the key reason. Cloud solutions are inherently more flexible than premises-based solutions, offering businesses the ability to scale users up and down, centralize management, and deploy new features and applications quickly," said Diane Myers, principal analyst at Infonetics Research. The number-one unified communications device used by respondent businesses is the smartphone, ahead of traditional computing devices such as laptop and desktop computers. Web- and video-conferencing and text messaging are increasingly becoming part of businesses’ UC communication types, reflecting changing user behavior. By early 2016, 93 percent of respondents plan to implement video conferencing into their UC solution. When choosing a unified communications supplier, enterprises surveyed ranked product reliability and technology innovation as the most important criteria. When asked about their perceptions of unified communications vendors, respondent businesses rated Cisco highest in product reliability and Microsoft highest in technology innovation. The most important criterion to survey respondents when selecting a cloud or hosted UC service provider is security levels to protect company communications.